There's so much to see and taste in Mexico City that a few days is barely enough to scratch the surface. One thing I realized on my first visit there last week is that you can do sightseeing, walking and museums or you can track down the restaurant and taco stand treasures you may have researched beforehand, but it's pretty hard to do both. So our eating was not planned particularly strategically, but fortunately, it seems hard to go wrong in DF (Distrito Federal, what the locals call their city, while the slang word for a local is Chilango). As I explained in my earlier post, Why You Totally Have the Wrong Impression About Mexico City, for our first visit we mostly stayed around the Condesa and Roma neighborhoods, which are safe, walkable and full of great tastes. Also, if you're wondering how safe it is, please read the earlier post. Here are a few highlights. The markets and their food stalls: Mercado Medellin, Mercado Roma, Tianguis CondesaThese three were the perfect intro to Mexico City's broad selection of indoor and outdoor markets. Mercado Medellin is an indoor market that despite being in the trendy Roma neighborhood is not too gentrified -- think Grand Central Market before the new places arrived. It's a manageable size, with clean and welcoming stalls, many of which cater to the surrounding Cuban and Central and South American community. A long corridor on the side is lined with full-service restaurants serving extensive, very well-priced breakfasts and lunches. In the center of the market we tried a terrific fruit juice stand, Las Delicias, where my breakfast was a huge bowl of yogurt topped with granola and several kinds of freshly-cut fruit. The mixed juice drinks there are named for their health benefits like energy or digestion. Breakfast #2 was right next door at the well-known seafood stand La Morenita, where we tried just-fried shrimp empanadas with mayo and crunchy shark (cazon) tacos. Just a few blocks away, Mercado Roma is the exact opposite: Think Grand Central Market with only the new merchants. It's brand-new, caters to whatever the Spanish word for yuppie foodie hipsters is, and despite being more expensive than regular markets and the kind of place you might spot a man-bun, it's still packed with delicious edibles like the best churros I've ever had at El Moro, fried up to order with a choice of sweetened condensed milk, chocolate sauce or cajeta (caramel) sauce. The Bendita paleta stand where we had a creamy mango chamoy popsicle is also worth a stop. It's open from about 11 am to 7 pm, except the restaurant and beer garden, which are open later, and is probably one of the few places in Mexico City to get banh mi, pastrami sandwiches, and a large selection of craft beers. 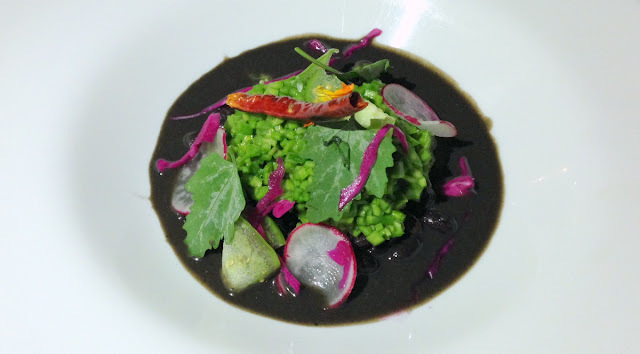 Some of the stands, like Azul Antojo, are offshoots of well-known restaurants in Mexico City. The only one that seemed kind of ridiculous was the cold-pressed juice stall, selling bottled juice at nearly Silver Lake-level prices in a city where every street corner has a perfect fresh juice stand. Fun fact: The trendier places in Mexico City go all-out with their bathroom design. Fun sinks are key, apparently. Even if you've toured the indoor markets (on my next trip, I'll make sure to make it to Mercado San Juan, apparently the favorite of chefs and gourmet home cooks), it's fun to check out one of the weekly farmer's markets. Fortunately we were there on a Tuesday for the Tianguis Condesa near Chapultepec park. First we toured the fruit and vegetable stands, admiring the pre-cut veggies waiting to be made into soup and the shiny fruits that looked like they had been scrubbed down, and trying samples of unusual fruits, such as several different types of sapotes, including mamey. 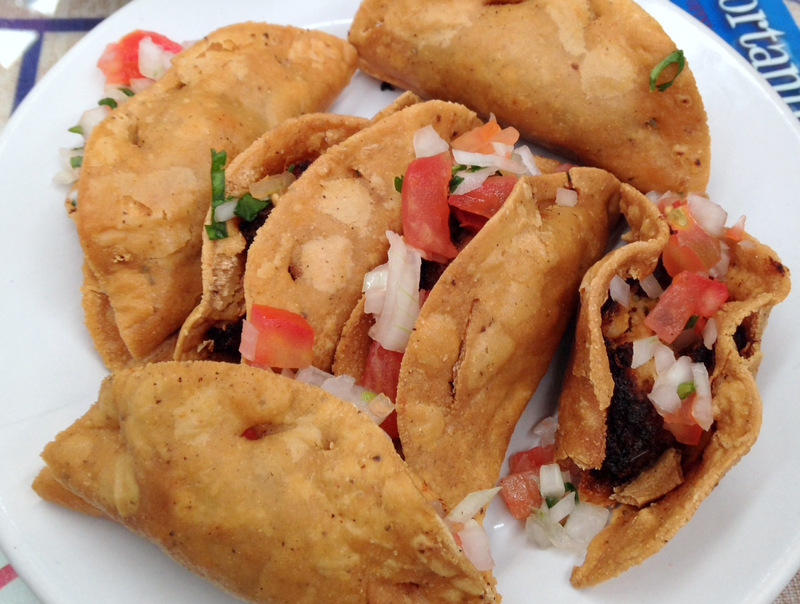 Tip #1: Samples are freely handed out everywhere you go in Mexico City, a very handy way to try a few extra flavors. Take advantage! Market stands specialize in foods including flautas, tamales, carnitas, seafood, barbacoa and guisados. We tried the tlayucos, oval disks made from blue cornmeal, and gorditas, round disks pre-filled with cheese. After choosing which you prefer, you customize the base with toppings that include potatoes, huitlacoche, mushrooms, spinach and more. Though the tlayucos were more unusual, we found the gorditas had more flavor, probably due to the hidden bits of crunchy pork in the middle. Three gorditas and two cups of jamaica (hibiscus punch) cost about $5. Everyone from one of Mexico's biggest movie producers to an L.A. bookstore manager recommended we try hotspots like Pujol and MeroToro. They didn't fit in our schedule, though we did hit Contramar, the exceedingly civilized lunch-only seafood spot from the owner of MeroToro. It was one of the few places where the waiter spoke good English, so why did I still insist on ordering a minnow (or anchovy?) taco? I'm still not sure. I found it to be an interesting contrast between tiny crispy fishies, smooth avocado and fiery curtido, Matt was not a fan. Our other dishes were perfectly cooked and startingly fresh, but the highlight was the caramelized coconut flan tart for dessert. If you go to Contramar, you might want to step it up a notch since many of the businessmen are wearing suits. Also, make sure you get a Spanish-language menu if you want to see all the day's specials (La Guerrerense-style tostadas, anyone?). I found Broka when browsing Chilango.com, and it turned out to be a lovely hidden restaurant in an old house in the Roma neighborhood. Soft jazz playing, tender, meaty grilled octopus and the momentary pleasant surprise when you enter the courtyard through the kitchen are just a few things that make Broka an excellent place to recuperate from the day's sightseeing. Their blackberry mescal cocktail doesn't hurt either. This would be a great place to catch up with friends on a quiet weeknight. Tip #2: Broka was one of the few places nearby open on a Monday night, as many restaurants are closed both Sunday evenings and Monday all day. Make sure to call ahead or check a reliable source. Also, many of the interesting restaurants are lunch only, which lasts from about 1 pm to 5 pm. Try to plan a big, late lunch and a light dinner, though it's not always easy when sightseeing. We came upon Xnic after a tiring day climbing the pyramids of Teotihuacan, just as we were about to run out of steam. Just off the Avenida de los Insurgentes in Condesa, it's a tiny, brightly-painted storefront that specializes in the Yucatan marinated pork dish cochinita pibil. Starving, tired and thirsty from scaling ancient rocks in the warm sun, I devoured a set lunch ($5) of cucumber-lemon agua drink, tortilla soup, a cochinita taco and a panucho (rolled tortilla with cochinita filling). It looks like a great spot for a hearty breakfast, as well. Tip #3: Even in the most upscale neighborhoods, there are still plenty of lunch stands and smaller restaurants to choose from. If you're trying to keep it cheap, even ritzy Polanco has street food, falafel windows and bakery samples. After checking out the Diego Rivera murals at the Palacio Nacional in the Zocalo square and a curious exhibit of horror statues called "Miedo" nearby, we walked down 5 de Mayo, a street which has some of the city's oldest shops and restaurants. Celaya, at number 39, is a more-than-100 year old candy shop with a beautiful art nouveau glass storefront and gold mirrored interior. Their tamarind candy was some of the best I've ever had and the cajeta fudge also looked wonderful. If you need to rest your feet, stop in at no. 10 and have a cocktail or beer at La Opera bar, a baroque spot dating from 1876 covered in dark carved wood and flocked wallpaper. According to the website, Gabriel Garcia Marquez and Octavio Paz were among the patrons who enjoyed drinking there. We fell down on the job when it came to trying all the famous taco places, I'm sorry to admit. The first night in the apartment we didn't want to go far so we had tortas and tacos al pastor at Tortas al Fuego. Extremely cheap and two steps from our door, it had very solid food, but it's not well known like Tacos El Guero or El Tizoncito. 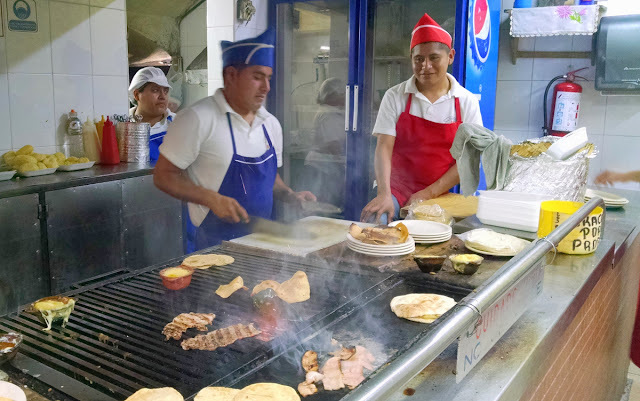 But at least we did make it to Los Parados, which means "the standing-up people," a popular stand open until midnight every night with a huge menu of grilled meats and even nopales or poblano tacos for vegetarians. Even better than the bistec and chuleta (beef and pork chop) tacos were tocino or bacon, fried to a light crackle on the griddle and eaten standing up at the counter, dripping with an array of condiments, in full view of a pretty amazing-looking hamburger laden with chiles and cheese. Mercado Roma isn't open for breakfast, but we lucked out when a guard directed us next door to La Boheme. I might not normally seek out a French cafe in Mexico, but our breakfast of tangy green chilaquiles and eggs en cocotte with bacon and fig-topped baguettes was the perfect ending to four days of walking, eating and drinking. After spending a few days in Cabo San Lucas, we were ready to move beyond tequila. Mexico City has a number of cool little mezcal bars that generally feature interesting music, a youngish crowd, and lengthy mezcal lists that can be tricky to figure out if you're not familiar with each type. Some bars serve only straight mezcal, beer and a few snacks; others do cocktails. The barman at La Clandestina explained the drill: Each shot of mezcal comes with a few slices of orange sprinkled with chile powder. You order a beer or a jamaica agua to chase it. We asked him to bring us a flight of three, from light and floral to very smoky and higher alcohol. Though it's made from the maguey plant, which is a cousin to the blue agave tequila is made from, mezcal in general has a milder and purer flavor. We tried one called pechuga (breast), which I could have sworn the bartender explained had something to do with chicken. I looked it up later and sure enough, the mezcal is distilled with a chicken breast, fruits and herbs, giving it a hint of savoriness and umami. La Clandestina in Condesa is cozy, dark and of course has no sign. It has a few small tables and a long and well-annotated mezcal list, and the staff is very helpful with suggestions. If you prefer a mixed mezcal cocktail like the spicy one we tried garnished with several whole grasshoppers or fresh fruit ponche & mezcal, right next door is La Lavanderia, which has more tables and a menu of Oaxacan snacks. Bosforo is on a side street just off Avenida Independencia in the Centro neighborhood, and like La Clandestina is signless and intimate. There are no tables -- most people sit at the long bar while others climb a staircase in the rear to recline on pillows in the carpeted loft. Bosforo's eclectic music mix of Turkish disco and indie chill-out tunes gives the place kind of an opium bar vibe, depending on how much mezcal you consume. English is spoken, and it seems to be popular with ex-pats. Tip #4: One great thing about Mexican bars is that even the smallest ones seem to be able to rustle up a plate of cooked food with no more than a hotplate at their disposal. If you've had a big lunch, you can easily have a hearty snack at the bar, skip dinner and do late-night tacos instead. Pulqueria Los Insurgentes, right on Insurgentes, the big street that separates Condesa from Roma, specializes in pulque, another drink made from the maguey plant. Slighty fizzy, the milky, fermented drink is about as alcoholic as a beer and is an acquired taste for most, but you need to try it at least once. Los Insurgentes's pulques, displayed in large jugs behind the bar, are made with fresh fruit flavors that do a heroic job of covering up the drink's inherent backwash quality. After you finish your pulque you can order beer and a snack plate packed with green chorizo, cheese and more while relaxing to New Order and the Cure and admiring the historic mansion it's housed in. With some bigger tables and and a second floor, this place could accommodate a larger group if necessary. Later at night, there's a dj and dancing. Cash only. If you want to get to taste the maximum number of things and could use a little guidance, there are several food tours of Mexico City. We were there during the week so we weren't able to try Club Tengo Hambre's street food tour on Saturdays, but it can also be arranged for other days. CTH was co-founded by L.A.'s own StreetGourmetLA Bill Esparza, starting with trips to Tijuana and Ensenada, and has branched out to Mexico City. Yelp usually has only a few reviews per restaurant in Mexico City, but it's helpful for addresses and hours. Trip Advisor gives a general idea of places more likely to appeal to tourists. Don't take the reviews as gospel on either site, of course. If you can read even a bit of Spanish, I recommend Chilango, basically the equivalent of the L.A. Weekly. The restaurant listings are pretty easy to figure out and much more descriptive and up-to-the-minute than guidebooks. Their yearly city guide, which was thoughtfully provided at our AirBnB, is very helpful for getting the lay of the land. Of course there are many food blogs covering the city, some in English -- one I came across several times is Culinary Backstreets. Let me know if there are other blogs, restaurants, tacos, etc. you recommend. Next time we'll be seeking out some great mole, tacos guisados, traditional restaurants and much more. And finally, here's a pretty good list of Mexican menu words. Buen provecho! Wow. What a great resource. My wife and I are planning a trip down that way in the next couple months. We'll definitely be referencing this list. Thank you!